When push comes to shove in an explosive comedy about a post-funeral family firestorm, it’s almost impossible to take sides. Bad Jews runs until June 4, 2017 at Artscape Youngplace. While narrative baselines involving social gatherings in response to the death of a loved one is by no means an original idea the challenge for any playwright is how to give the foundation a different spin. Joshua Harmon flexes his full frontal Jewdidty to gift playgoers with a remarkably funny offering that brings the identity debate to a new conceptual intersection. Don’t confuse Bad Jews as a story about horrible people doing terrible things. 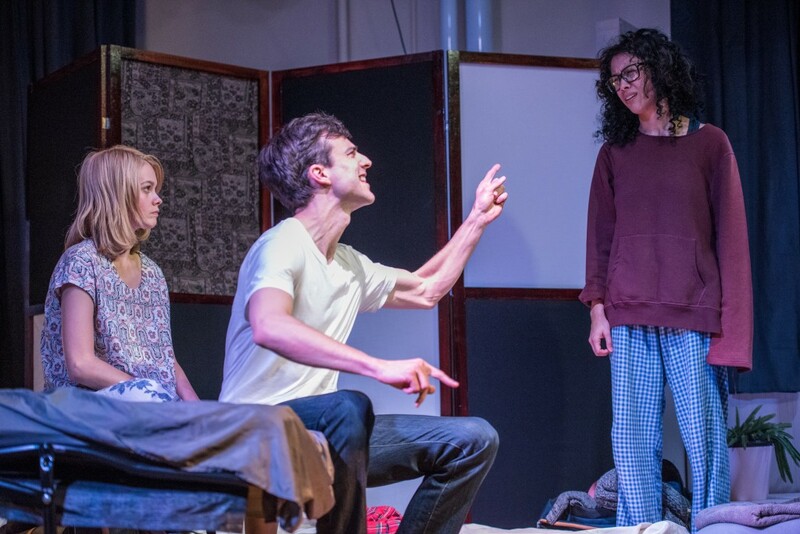 Quite the contrary in this fabulously layered play featuring two siblings with contrasting personalities, an outspoken cousin with an innate desire to clear the air and a meek & mild girlfriend stuck in the middle. All of which unfolds in a tight 400 square foot apartment space overlooking NYC’s illustrious Hudson River. What could possible go wrong in the grieving process, you ask? A tumult of crass commentary erupts when scruples, cultural tradition, and spiritual values are tabled for discussion. If there’s one take away in this barmy, claw marked presentation it’s the reality that we’re stuck with the family we’re dealt with, not the one we wish we could have. Julia Valley is pleasurable as the uncomplicated love interest, Melody, fighting a family inferno with Dan Krantz captivating as the withdrawn Jonah who avoids conflict at every differentiating opinion that heats the air. Keep an eye on Kristopher Turner’s head locking Liam as he vigourlessly switches from carefree, privileged snowboarder to rightful family heirloom inheritor. If there’s a case to be made for unpopular personal choices, he’s the kind of actor that prevents the black & white from seeping into a tense scene. It’s Daphna’s holier-than-though presence that serves as the vocal powder keg throughout the piece. Rebecca Applebaum taps awkward with remarkable ease and when it comes time for the performer to defend her character’s belief system, you can’t help but be absorbed by the unadulterated bitterness. If you’ve not yet waded into a deeply Jewish play that boldly illuminates the universal undertone of discontent, Bad Jews the perfect entry point. It’s a powerful show that says exactly what it needs to without getting lost trying to say more.